In 2012, the Village of Arlington Heights Board of Trustees approved the Arlington Downs mixed-use development, a $250 million project that includes a 161-room hotel, 214 luxury rental apartments, an expanded water park and two new residential rental towers with a total of 443 luxury apartments. In addition, the development includes retail and entertainment space. Public officials hope the expansion will provide a boost to surrounding businesses and attendance at local events, as well as better serve the village’s needs. The location of the property makes the development particularly important to the village. Mixed-use development is what the site is best suited for, but public officials wanted to take a fresh approach. The Village of Arlington Heights was intentional as it designed the redevelopment. The board and village officials wanted to provide residents with something new and exciting, yet useful and welcoming for visitors to the area. According to Witherington-Perkins, the mixed-use development provides something for nearly everyone to enjoy. Faced with a struggling economy and a failing property, the village has overcome some formidable obstacles throughout the redevelopment effort. The municipal government needed to find people who were committed to a long-term solution. The village was then interested in finding a developer that would create a strong long-term plan, rather than just a short-term fix. Arlington Downs Residential, a joint venture between Stoneleigh Companies and Ust Adspo JV is developing the residential component. Large-scale developments like Arlington Downs often require revising plans along the way, something the village has done at multiple points since approving its master plan in 2012. At this time, the project is well underway and has clear direction moving forward. Canadian developer Great Gulf Homes’ planned Turtle Creek apartment tower isn’t trying to compete with other new rental projects in central Dallas. With only 50 units, the 13-story building at Fairmount Street and Turtle Creek Boulevard is chasing a small niche of North Texas luxury housing market. “This will be a boutique building aimed at professionals and executives who are interested in downsizing to a rental or who have just moved to Dallas,” said Great Gulf president Christopher Wein. Great Gulf’s Oak Lawn tower is one of more than two dozen high-rise residential buildings already under construction or planned to start in the Dallas area. More high-rise residential buildings are in the works than at any other time in North Texas. Altogether, they will have more than 6,000 luxury housing units in products ranging from redeveloped downtown office towers to posh new Uptown condominium high-rises. “We are adding 30 or 35 high-rise towers in the Dallas urban core,” said Greg Willett, vice president of apartment analyst MPF Research. “We’ve never seen as much construction as this. “Over the next couple of years as we start bringing in this product to market, I think it could be a little bit more challenging” to rent them all, Willett said. Dallas and Houston now have more apartment towers in the pipeline than any other U.S. cities, he said. So far, developers haven’t had any trouble finding enough affluent renters to fill these luxe Big D towers — even at rents starting around $2,500 a month for the smallest units. Dallas attorney Meredith Elkins recently settled into the new Gables McKinney apartments on McKinney Avenue in Uptown. The almost-finished development, which has seven floors of apartments perched on top of a Whole Foods Market grocery store and a parking garage, is her first experience living in an urban rental project. She initially had concerns about renting in the multistory building. “I moved from a duplex where I had a backyard for the dogs,” Elkins said. “It was not what I was necessarily looking for at first, but it’s been great. One tower is under construction just across the street. The 20-story One Uptown building at McKinney and Routh Street will have 198 “ultra high-end” apartments with retail on the lower two floors. The retail space is already leased to two restaurants. The building is scheduled to open at the end of next year. It’s being built with a curvacious exterior of concrete and glass. Another high-rise is opening a couple of blocks away in early 2016. The 23-story Jordan apartment tower on Routh Street near McKinney will have more than 200 apartments starting at about $2,500 a month. StreetLights’ building will open ahead of the biggest wave of new apartment towers on the way for Dallas. The developer just started another rental tower in Deep Ellum called the Case Building — a 17-story high-rise with 337 apartments. StreetLights also plans to begin work before the end of the year on a 183-unit tower on McKinney Avenue near Knox Street. The next two buildings won’t be ready until 2017. “The construction lead times on projects like these are longer,” Bakewell said. The biggest concentration of apartment towers is under construction or about to start in the Victory Park project near downtown. Three towers with more than 1,100 luxury apartments have recently broken ground. 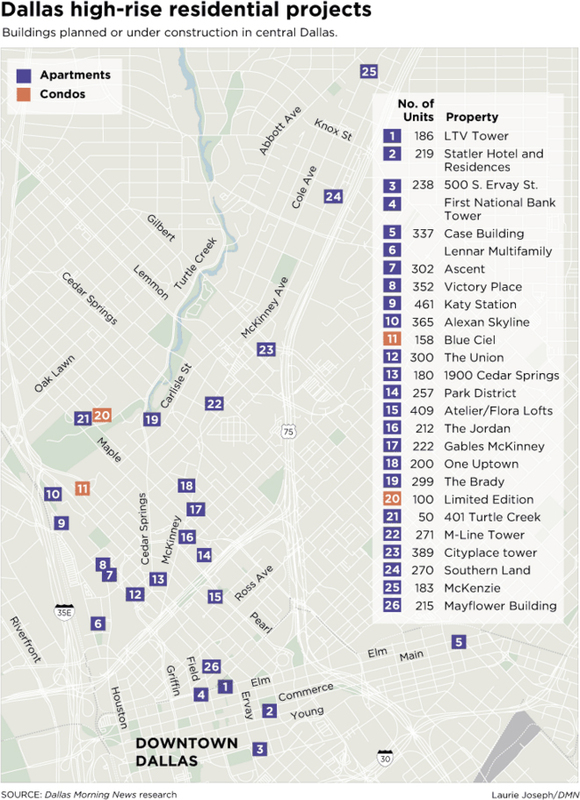 The first to start was the 302-unit Ascent building on Houston Street across from the American Airlines Center area. The 23-story tower is being built by Greystar Real Estate Partners LLC. “We are scheduled to deliver first units in first quarter 2017,” said Greystar’s Laird Sparks. Three other Victory Park apartment towers are being developed by Novare Group, Genesis Real Estate and Lennar Corp. These towers will be the largest additions to Victory Park since the original construction of the project almost a decade ago. The push to build residential towers in North Texas has expanded to include sites in Plano. Builders plan to break ground next year on a 30-story, 312-apartment tower in the $2 billion Legacy West development on the Dallas North Tollway in West Plano. The rental high-rise will be right next door to a proposed 24-story condominium tower that is already half sold. “It’s a lifestyle choice that appeals to a lot of people,” Willett said. “As it turns out, many of the renters in these high-rises aren’t the millennials everyone talks about but older residents including baby boomers.